Having inherited her father's farm, the spirited and feisty young Bathsheba Everdene finds herself playing mistress in a man's world. She is pursued by three would-be lovers: the constant shepherd, Gabriel Oak; the obsessive landowner, William Boldwood; and the reckless Sergeant Troy. But are any of them a match for the headstrong and independent Bathsheba? Léa is a recent graduate of the John Abbott Professional Theatre Program where she received the Departmental Award. She has enjoyed playing roles such as Sophie in The Chrysalids, Chris Gorman in Neil Simon's Rumors and Helena in A Midsummer Night's Dream. She has also trained at the Quinte Ballet School of Canada and graduated from the Professional Training Program in 2008. Her extensive dance training has given her great opportunities such as Dance Captain in John Abbott's production of Fiddler on the Roof and choreographing Janus Production's The Tin Can People. Léa is grateful for the wonderful opportunity to play such a strong female character. She is delighted to be part of Persephone Production's Far From the Madding Crowd and to be working with such a wonderful cast. It is a wonderful opportunity for Ian to play the role of Troy after having graduated John Abbot's Professional Theater program this past spring. During his time at John Abbott he was fortunate enough to play the roles of Leonard Ganz in Neil Simon's Rumors, Demetrius in A Midsummer Night's Dream and Motel in Fiddler on the Roof. His most recent credit was playing a chorus member in Janus Production's The Tin Can People which performed at the Edinburgh Fringe Festival this past August. Ian is greatly looking forward to take part in his first production with Persephone, to work with what he's sure will prove to be an amazing ensemble and to play a role in telling this incredible story. Julianna is a graduate of the John Abbott College Professional Theatre Program. Some of her favourite roles have been in Hair (JAC Theatre), You Can't Take It With You (JAC Theatre), Elektra (JAC Theatre), Aladdin (Left of Centre Theatre Co.), Henry V (Persephone Productions) and she most recently appeared in Titus Andronicus (Montreal Shakespeare Theatre Company). Julianna is thrilled to be working once again with the talented team of artists that make Persephone Productions so special. 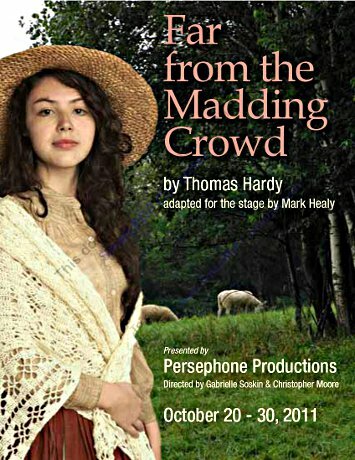 Lia is very excited to be working with Persephone Productions for the first time in the stage adaptation of Far From the Madding Crowd. Lia is a recent graduate of the John Abbott College Professional Theatre Program where she was awarded the Jason Panich Memorial Scholarship. Recent credits include Cookie in Rumors, Petra in The Chrysalids, Starveling in A Midsummer Night’s Dream and Queen Tamora’s Slave in Titus Andronicus. She can also be seen touring schools with the Montreal Shakespeare Theatre Company this year in their production of Romeo and Juliet. Clive has been involved with theatre in and around Montreal for several years. 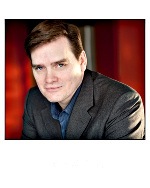 He was recently seen as Frank Strang in Equus for Village Scene Productions. Other credits include Exeter in Henry V, Brabantio in Othello and Sid in West for Persephone Productions, Chandebise / Poche in A Flea in Her Ear for Hudson Village Theatre, Paravicini in The Mousetrap for Hudson Players, Gerald Lyman in Bus Stop for Level II Theatre, and John Malcolm in Separate Tables for Lakeshore Players. Clive is thrilled to be working with Persephone again on this production. Frayne McCarthy is a bilingual performer whose stage roles have taken him throughout Europe and across Canada. Selected credits include: Marius, Les Misérables (French World Premiere); Capt. Haddock, Tintin, le temple du soleil (World Premiere Belgium); Verrochio, Da Vinci (Paris); Tony, West Side Story (European Tour); Pacifique, Pélagie (E. Canadian tour); Capt. Kowalski, Past Forgetting (National Tour); Bill/Harry U.S., Mamma Mia! (Toronto); Napoleon U.S., Napoleon (Toronto); Zeller, The Sound of Music (Lloyd-Webber Production, Toronto); Jamie, The Last 5 Years (Hudson); Bedford, Jeanne(Montreal); Bobby, Company (Montreal); Kirkpatrick, To the Green Fields Beyond (MECCA Award '07, Best Ensemble Cast for Persephone Productions); Cap in Hope in Chaos (Montreal); Scrooge , A Christmas Carol (Montreal); Big John/Philippe, Le Petit Roy (Montreal). Mr. McCarthy is also a director, designer, and playwright. He has seen several of his works for young audiences produced by the Turtle Island Theatre Company, and was commissioned by the National Arts Centre of Canada to write his musical play AutoPortrait with composer Daniel Boulerice. Frayne is currently in development of The Virgin Courtesan, a new musical, with composer Blair Thomson. Lily began her acting career at the age of 11 when she played the role of Annie in Annie with Purple Dragon Theatre. She continued to perform in musicals for the next six years, playing roles such as Nala in The Lion King. She has just graduated from Dawson College's Professional Theatre program where she played roles such as Moth in Love's Labour's Lost, Nina in The Seagull, and Marguerite Gendron in The Coronation Voyage. She also played the role of Martha Cratchit in The Rialto Theatre's production of A Christmas Carol last December and played the role of Nina again in Title 66 Productions' original piece, Chekhov's Children, last July. Lily is very excited to be a part of Far From The Madding Crowd and is greatly please to be working with the cast. Jeremy is a 2011 graduate of the Dawson College Professional Theatre Program, where he was awarded the Beryl and Willie Moser Award for Theatre. He had the opportunity to play a variety of challenging roles such as Trigorin in The Seagull, Don Armado in Love's Labour's Lost, Chandebise and Poche in A Flea in her Ear and The Diplomat in The Coronation Voyage. Soon after completing his training, he and some fellow graduates (including fellow cast and crew members Lucas, Lily, and Alex) created Title 66 Productions and produced their first play, Chekhov's Children, in which Jeremy played the role of Treplev. This is Jeremy's first time working with Persephone, and he is grateful for the opportunity to tell the story of Gabriel Oak. Lucas is a recent honors graduate from the Dawson College Professional Theatre Program. He has had the pleasure of protraying a panoply of diverse characters, such as, the-ever-so-clever Lord Berowne in Love's Labour's Lost, the raging Spaniard Homenides in A Flea in Her Ear, the tormented mafioso known as the Chief in The Coronation Voyage, and the obsessive writer Boris Trigorin in the adaptation of The Seagull, Chekhov's Children. Lucas is excited to explore the world of Far From the Madding Crowd, with Gabrielle, Chris and the wonderful and talented cast. Pamela Perrotti is a recent graduate of the John Abbott College Professional Theatre program where she had the opportunity to play such roles as Sofie in The Chrysalids, Chris Gorman in Rumours and Snug in A Midsummer Night’s Dream among others. She is very excited to be working with Persephone Productions for the first time. Newly graduated from the Dawson College Professional Theatre Program, Alex is very excited to be working with Persephone on this movingly human adaptation of Hardy's classic novel. While he trained primarily as an actor, Alex has been designing lights with just as much enthusiasm, and his work has been seen in such recent productions as Black Theatre Workshop's Mulatto Nation, Playwright Hero's The Vindictive Vice-President, and Title 66's Chekhov's Children. Christa Marie Emerson is entering her third year of the doctoral program in music composition at McGill University where she studies with Jean Lesage. Prior to composition, she studied psychology and worked as a counselor and in crisis intervention before beginning her formal music studies. As the 2010-2011 composer-in-residence for the McGill Contemporary Music Ensemble and the Schulich School Singers, her piece schwarz und stern, which used texts by Rainer Maria Rilke and Else Lasker-Schüler, was premiered last March by conductor Julian Wachner and featured Rebecca Woodmass as soprano soloist. Christa's upcoming projects include working as composer-in-residence with the Montreal's Portmantô ensemble and for this residency she is writing a song cycle with theme of "Love in Dreams" to be premiered by Portmantô and baritone Cairan Ryan in their coming season. This is her first time working with Persephone Productions and she is quite excited and honoured to have the opportunity to work with such an amazingly talented cast and production team. Genia is a graduate of the John Abbott Theatre Design Program, where she is credited with the costume design for Cloud 9 and the set design/scene painting forFiddler on the Roof. This year she has been fortunate with the opportunity to design set and costumes for Tin Can People (Janus Productions) which was performed in the 2011 Edinburgh Fringe Festival, as well as work on Titus Andronicus with The Montreal Shakespeare Theatre Company. This is Genia's first time working with Persephone Productions and is excited to work with such a talented group. Malcolm has been an active member of Westmount's amateur theater group Dramatis Personae for the past 10 years. In that he has played Marvin Macy in Carson McCuller's Ballad of the Sad Cafe, Richard Cory in A. R. Gurney's play of the same name, and Captain Cat in Dylan Thomas's Under Milk Wood. This will be his first time he has taken on the task of Stage Manager and he is excited to be given the opportunity to be part of the Persephone production team.